Each day, hundreds, if not thousands, of people die needlessly in rural India due to lack of safe, affordable blood products. Our team and other physicians have earlier described rural India’s dependence on an often dilapidated, unsafe and inefficient blood banking system (1, 2). Recently, issues related to the safety of and access to this life-saving treatment have returned to the public eye. According to the data released by the Indian National AIDS Control Organisation (NACO) in 2016, 2234 new cases of HIV were attributed to blood transfusions over 17 months (3). The report has led to increasing advocacy by individuals for an overhaul of blood transfusion regulations. Here, we describe the existing framework for blood transfusion and discuss the deficiencies of this system in the context of surgical care in rural India. Next, we combine guidelines from NACO with a framework developed by Stainsby and colleagues (4) to detail an improved process for blood transfusion, especially in the setting of emergent, life-threatening haemorrhage (5). Finally, we discuss this transfusion practice in the context of both high and low-income settings and further our argument regarding its appropriateness in the context of rural India. The existing framework depends on a functional blood bank, in close proximity to every hospital in the country, which can be rapidly accessed and has a large pre-screened pool of blood available at all hours of the day. There are several important reasons as to why this system fails to provide timely access to safe blood for patients in rural India. First, India is a wide and vast country, with simply too few NACO-approved blood banks to cover all areas. This patchwork of private and public blood banks is largely concentrated in urban centres, leaving a large portion of rural India’s patients and providers out of reach of the existing blood infrastructure (6). There are some 80 districts that have no access to any blood bank whatsoever (7). Second, the existing blood banks often lack a sufficient supply of blood products (8). These deficits lead to extraordinarily variable costs of blood, often leaving this essential treatment out of the reach of many patients and their families. Third, despite the government regulations on the testing of blood for transfusion-transmittable infections (TTI), there are significant failures with regard to the testing, safety and quality of blood (9, 10). Finally, although non-voluntary and paid blood donations have been shown to be associated with a significantly higher incidence of TTI, both in India (11) and more broadly, in low- and middle-income countries (LMIC) (12), and in spite of a Supreme Court ruling outlawing non-volunteer donations, a significant portion of the blood available at NACO-supported blood banks continues to be procured from these illegal sources (13). This fractured system often has disastrous consequences for those living in rural India. The system requires a family member of a patient in emergent need of blood transfusion to travel to the nearest blood bank, which is often hours away. If the blood bank has an insufficient supply of blood, the family members must furnish a willing, healthy replacement donor. They must then navigate the process of donating blood and obtaining proof of donation before travelling back to the hospital, blood in hand. This process is problematic for three important reasons. First, it results in extensive delays for patients urgently in need of blood products, leading to many unnecessary deaths. Second, the system is prohibitively expensive for many patients and their families, due to the high cost both of blood and travel, which again results in unnecessary deaths. Third, the system very often relies on non-volunteer replacement donors, thus increasing the overall risk of TTI within India’s blood bank supply pool. 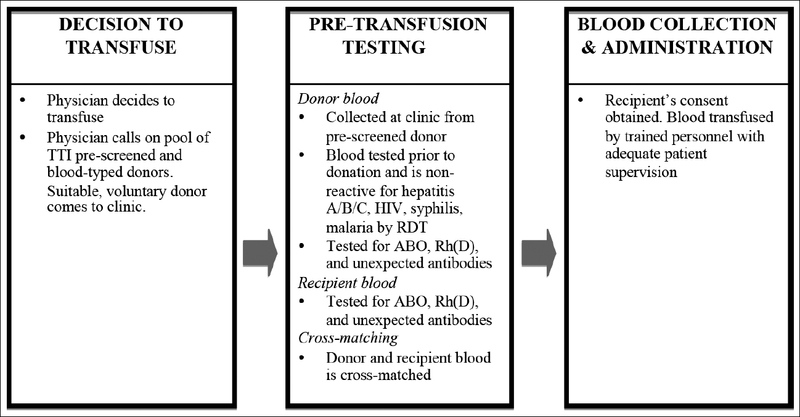 Figure 1: Process map for unbanked-direct blood transfusion (UDBT) in rural areas, based on Stainsby and colleagues’ (2005) framework. Our proposed framework (Fig 1) places a safe, reliable blood supply within the reach of each hospital, with the costs being a fraction of those that would be involved in operating a full blood bank. First, donated blood is procured and used for treatment in the local hospital. This greatly improves the likelihood of timely access, and also significantly reduces the cost incurred by patients and their families. A prospective trial in Malawi found that such a system reduced the cost per unit of blood by more than 67%, even without taking any travel costs into account (14). Second, blood is collected from a pool of voluntary, pre-tested donors that is organised by physicians, thus limiting the reliance on unsafe replacement donors. This system has the added benefit of placing the responsibility for procuring blood on the treating physician, rather than on patients and their relatives. In addition, pre-screened donor pools are utilised by blood banks in urban India to ensure the availability of rare blood groups; thus, there should be no legal obstacle to employing the practice in rural India. Third, because the blood is directly transfused after appropriate testing, there is no need to rely on costly refrigeration systems and inconsistent power supplies (15) to ensure the quality of the blood. The use of such systems for unbanked, direct blood transfusion (UDBT) has been widely adopted in military settings. During the NATO conflicts in Iraq and Afghanistan, thousands of whole blood transfusions were performed safely and effectively, using a similar pre-tested donor pool and rapid diagnostic testing at the time of transfusion (16). Moreover, the practice has proven so successful that efforts are under way to adopt similar whole blood-based treatments for acute haemorrhage in US civilian settings (17, 18, 19). Among the LMIC, a similar system has proved to be effective in a large trial at a district-level hospital in Ghana (20). The proposed UDBT process map would rely on the rapid diagnostic test (RDT) for HIV, hepatitis B and hepatitis C, rather than the more sensitive and specific ELISA tests. A major criticism of UDBT is that the process is unsafe due to inadequate pre-transfusion testing of donated blood using RDTs, rather than the ELISA. However, the numbers do not support this criticism in the context of the rural Indian hospital. The prevalence of HIV among voluntary blood donors in India ranged from 0.0017–0.0022 from 2010 to 2013 (11). Using the upper bound, this would mean that there would be an estimated 220 infected units per 100,000 transfusions. The WHO reports that the HIV RDT has a sensitivity of 0.976 and the ELISA of 1.0. This means that the RDT would correctly detect 215 out of 220 units of infected blood (hence missing 5 units) (21, 22). Is the consideration of the theoretical risk of five additional HIV infections per 100,000 blood transfusions a rational choice when many more experience morbidity or mortality due to the lack of blood at rural Indian hospitals every day? In addition, WHO recommends the use of a highly sensitive and specific RDT in remote, rural laboratories, where the number of samples tested, staff training and the reliability of power supply may prove to be hurdles in ELISA testing (23). NACO also allows the practice, and many rural blood banks in India already employ RDT for the transfusion of banked blood. Thus the practical, population-level impact of our proposed UDBT framework on TTI rates would be even less than that presented here. More broadly, there is a significant amount of data demonstrating that testing for TTI in LMIC remains substandard. These studies examine centres employing both the RDT and ELISA tests (24, 25). The evidence suggests that operator error and poor storage of instruments play a significant role in impeding safe blood transfusions. Proper training and context-specific test validation remain critical to maintaining a safe blood supply, both in high- and low-income settings, and careful training must be the cornerstone of any effort to improve the safety and quality of blood. The implementation of the framework we have proposed should be accompanied by a robust training and certification process on the use and validation of RDT. There is credible evidence from both high and low-income settings that direct unbanked whole blood transfusion can be performed safely and effectively. There is also significant evidence that RDTs can be used effectively in both types of settings to limit TTI events to nearly zero. In the context of many LMIC, India included, it is likely that a robust system for UDBT, based on the framework we have proposed, will significantly reduce TTI events. It is clear that the current system in India is resulting in a premature end to innumerable lives due to delays and the prohibitive expense of blood products. Building thousands of functional, staffed blood banks with robust blood collection and safety protocols, as well as the ability to immediately separate blood into its components, would be both prohibitively expensive and logistically unfeasible. Such investment in blood bank infrastructure and technology in rural settings should remain a future goal for the government of India. In the interim period, the price paid by rural patients is too high, and we make a plea for UDBT to be investigated further as a safe and effective immediate alternative to the failing status quo. Funding support: RS was supported by a Fulbright-Nehru scholarship. Sharma DC. Concerns raised over poor blood safety systems in India. Lancet. 2016;387(10036):2369. doi: 10.1016/S0140-6736(16)30785-1. Stainsby D, Russell J, Cohen H, Lilleyman J. Reducing adverse events in blood transfusion. Br J Haematol. 2005 Oct;131(1):8-12. Bagcchi S. More blood for India. BMJ. 2014 Nov 28;349:g7166. doi: 10.1136/bmj.g7166. Agrawal A, Tiwari AK, Ahuja A, Kalra R. Knowledge, attitude and practices of people towards voluntary blood donation in Uttarakhand. Asian J Transfus Sci. 2015 Jan–Jun; 9(1):23-8. doi: 10.4103/0973-6247.150942. Choudhury N, Phadke S. Transfusion transmitted diseases. Indian J Pediatr. 2001;68(10):951-8. Ray VL, Chaudhary RK, Choudhury N. Transfusion safety in developing countries and the Indian scenario. Dev Biol (Basel). 2000;102:195-203. Nair SC, Mammen JJ. Repeat voluntary non-renumerated blood donor is the best quality indicator for blood safety. Indian J Med Res. 2015;141(6):749-52. doi: 10.4103/0971-5916.160687. Bates I, Manyasi G, Medina Lara A. Reducing replacement donors in Sub-Saharan Africa: challenges and affordability. Transfus Med. 2007 Dec;17(6):434-42. Bray T J, Prabhakar K. Blood policy and transfusion practice–India. Trop Med Int Health. 2002;7(6):477-8. Lara A, Kandulu J, Chisuwo L, Kashoti A, Mundy C, Bates I. Laboratory costs of a hospital- based blood transfusion service in Malawi. J Clin Pathol. 2007 Oct;60(10):1117-20. Epub 2007 Apr 5. Dubey A, Sonker A, Chaurasia R, Chaudhary R. Knowledge, attitude and beliefs of people in North India regarding blood donation. Blood Transfus. 2014 Jan;12 Suppl 1:s21-7. doi: 10.2450/2012.0058-12. Epub 2012 Nov 20. Spinella PC, Dunne J, Beilman GJ, O’Connell RJ, Borgman MA, Cap AP, Rentas F. Constant challenges and evolution of US military transfusion medicine and blood operations in combat. Transfusion. 2012;52(5):1146-53. doi: 10.1111/j.1537-2995.2012.03594.x. Epub 2012 Mar 12. Cotton BA, Podbielski J, Camp E, Welch T, del Junco D, Bai Y, Hobbs R, Scroggins J, Hartwell B, Kozar RA, Wade CE, Holcomb JB; Early Whole Blood Investigators. A randomized controlled pilot trial of modified whole blood versus component therapy in severely injured patients requiring large volume transfusions. Ann Surg. 2013 Oct;258(4):527-32; discussion 532-3. doi: 10.1097/SLA.0b013e3182a4ffa0. Stubbs JR, Zielinski MD, Jenkins D. The state of the science of whole blood: lessons learned at Mayo Clinic. Transfusion. 2016 Apr;56 Suppl 2:S173-81. doi: 10.1111/trf.13501. Yazer MH, Jackson B, Sperry JL, Alarcon L, Triulzi DJ, Murdock AD. Initial safety and feasibility of cold-stored uncrossmatched whole blood transfusion in civilian trauma patients. J Trauma Acute Care Surg. 2016 Jul;81(1):21-6. doi: 10.1097/TA.0000000000001100. Owusu-Ofori S, Temple J, Sarkodie F, Anokwa M, Candotti D, Allain JP Predonation screening of blood donors with rapid tests: implementation and efficacy of a novel approach to blood safety in resource-poor settings. Transfusion. 2005;45(2):133-40. Jayaraman S, Chalabi Z, Perel P, Guerriero C, Roberts I. The risk of transfusion transmitted infections in sub-Saharan Africa. Transfusion. 2010 Feb;50(2):433-42. doi: 10.1111/j.1537-2995.2009.002402.x. Epub 2009 Oct 15. Laperche S; Francophone African Group for Research in Blood Transfusion. Multinational assessment of blood-borne virus testing and transfusion safety on the African continent. Transfusion. 2013Apr;53(4):816-26. doi: 10.1111/j.1537-2995.2012.03797.x. Epub 2012 Jul 13. Bloch EM, Shah A. Kaidarova Z, La Perche S, Lefrere J-J, van Hasselt J, Zacharias P, Murphy EL. A pilot external quality assurance study of transfusion screening for HIV, HCV and HBsAG in 12 African countries. Vox Sang. 2014;107(4):333-342. doi: 10.1111/vox.12182. Epub 2014 Jul 23.